It was cold, with blue light. The shadows were dark. Dead Quiet. I chose this subject to paint because the gates at the Asylum were locked; (there was no getting back in). I was on the outside looking in. Oh, there was activity though. The lights were on, inside the room with baredwindows.Shadows would pass across the windows from time to time. The warm orange interior light in contrast with the blue moonlight added to the theme of madness. It was during the silence I thought I heard voices wafting in the fog coming across the field next to me, where the rubble of Roman ruins lay. It was a good wine Eringer and I shared earlier that evening. (It must have had an affect on my auditory senses). Because of the overall blue moonlight, I toned the board red so as to make a violet tonal harmony from a distance. My thoughts: This is the same direction of sky that Van Gogh saw out of his cell window every night. 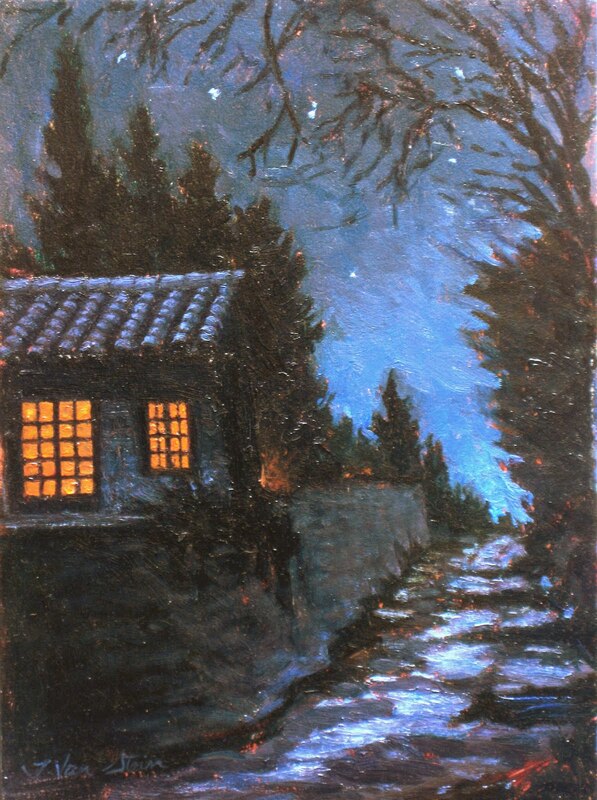 Because the moon was so bright there were hardly any stars about, but there were a few; enough to put in to my painting. I finished the painting, snapped a photo, then made my way across the field towards the entry gate to the asylum to do my second painting when a car approached; coming down the long, one hundred yard driveway in the darkness, I Popped out from the shrubs, in front of the car, near the Asylum gate and the driver slammed on his brakes, (in dramatic fashion), put the car in reverse, and quickly backed away in reverse, all the way back to the main road leading to St. Remy. Guess I scared him. (So what if I was dressed in all black winter gear with a Russian Winter hat with flashlight attached!). Outside the walls of the Asylum, I wasn't lurking, I was working!